The storyline of Meet John Doe echoes that of an earlier Capra film, The Miracle Woman. In both films, an amoral main character is cynically manipulated through the press, revered by a gullible public, and converted through a crisis of conscience. When the character attempts to confess to the public, the villain cuts the lights or the wires to the microphone. Capra ended The Miracle Woman with "the cheapest trick in dramaturgy: When a character bollixes up your story- -let him get hit by a truck. My villain, fearful of exposure, sets fire to the tabernacle. He dies. "(3) He had much more trouble resolving the hero's conflict with larger, institutionalized evils in Meet John Doe. In 1937, screenwriter Jo Swerling used Connell's story as the basis for a play, The World is an Eightball. Swerling's version heightens Connell's satire of high society and adds satirical criticism of the mass media and entertainment industries. Swerling's main character, Ferdinand Katzmellenbogen, is a shy photographer who gets drunk at a society party and announces his intention to commit suicide as a way to protest fascism. A Hindu mystic hails him as a messiah and rechristens him "John Doe"; radio and newspaper publicity spawns the formation of John Doe clubs nationwide, whose members plan mass suicide. Paramount Pictures buys the rights to film Doe's story and arranges to stage his suicide at the film's premiere on the 4th of July. Swerling never wrote the concluding act of the play. Richard Connell and Robert Presnell used Connell's original story and Swerling's unfinished script to write a screenplay version in 1939 titled The Life and Death of John Doe. Their script eschews Swerling's social satire and offers a more sober look at martyrdom. The main character is now John Doe, an anonymous worker at Grand Central Station. When his favorite movie star accidentally leaves her purse at the station, he crashes a party she is hosting to return it. In an attempt to gain the attention of her guests, he announces his suicide plans. A newspaper reporter who attends the party collaborates with Doe on daily newspaper columns and ghostwrites a radio speech in which Doe exhorts average citizens to protest war, poverty, and injustice. A John Doe movement springs up around the world; a coalition of corporate leaders and politicians conspire to bribe Doe and suppress the movement. Doe rejects their bribes and, inspired by his disciples' sincerity, keeps his vow to jump from a building on the 4th of July as his followers sing "The Battle Hymn of the Republic" on the street below. 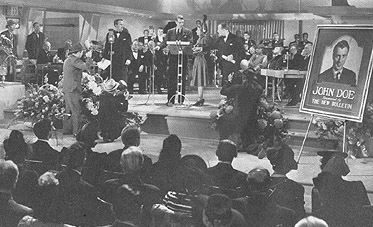 Capra and Robert Riskin purchased the rights to "A Reputation" and The Life and Death of John Doe in 1939. Capra and Riskin's final (except for the ending) script begins with the sale of The Tribune newspaper, whose motto was "A Free Press for a Free People," to tycoon and domestic fascist D.B. Norton. The New Tribune's motto is "A Streamlined Press for a Streamlined Age." The first act of 'streamlining' is a corporate layoff. Columnist Ann Mitchell retaliates by submitting a final column in which she prints a phony letter from a man signed John Doe who threatens to kill himself on Christmas Eve because he is unemployed. The column creates an instant public sensation. When the editor of another newspaper charges that John Doe is a fake, Ann and her editor Henry Connell hire a vagrant named John Willoughby, who is traveling through town with his hobo friend "the Colonel," to play the part. Through newspaper coverage, Doe becomes a spokesman for a hundred causes. Eventually he attracts the attention of Norton, who arranges for a radio speech by Willoughby. The speech, written by Mitchell, encourages average citizens to act together in a spirit of simple neighborliness. Norton witnesses his servants' enthusiastic reaction to Willoughby's speech and immediately announces the formation of apolitical John Doe clubs across the country. Willoughby is persuaded by Mitchell and by the members of the Millsville John Doe Club to embark on a lecture tour. Norton, meanwhile, arranges a national convention where Willoughby will announce the formation of a third political party, with D.B. Norton as its presidential candidate. Willoughby rejects the scheme and heads for the convention to tell the public the truth. Before he can speak, Norton's private stormtroopers cut the wires to the microphone and distribute papers announcing Willoughby is a fake. Willoughby plans to go ahead with the suicide out of despair and in an effort to redeem himself; members of the Millsville John Doe Club appear on the roof of City Hall and are able to convince Willoughby to abandon his suicide attempt. Connell's 1922 short story of identity as it related to class consciousness evolved into a feature-film length treatment of fascism and the media. Although Ann Mitchell's original John Doe letter protested four years of unemployment and an inability to get relief from the state government, Doe's protest, in subsequent tellings of his story, became a more general protest of the state of modern civilization. Frank Stricker argued that Capra thus "retracted the elementary political point" of Doe's mission, but Stricker misses the fact that Capra turns Doe's protest towards a more widespread political evil. (6) Morris Dickstein contended that in the years between Smith and Doe, "Capra's politics have leapfrogged in one bound from the rural evangelism of William Jennings Bryan to the antitotalitarian pessimism of Herbert Marcuse! "(7) Although fascist envoys sit in the Senate gallery in Mr. Smith Goes to Washington, the real threat Jefferson Smith faces is a domestic political machine headed by greedy capitalists. Within a national framework, Capra contrasted Smith's small-town, wholesome innocence to Taylor's big-city, affluent corruption. Doe's institutional scope was wider ; in it, Capra tackled a pressing international concern. When it was applied to this concern, the American cultural myth of the heroic 'backwoods innocent' broke down completely. "innocent fifty years ago with the innocency of irresponsibility...now we are immersed in world-wide resonsibilities...Our culture knows little of the use and abuse of power; but we have to use power in global terms. Our idealists are divided between those who would renounce the responsibilities of power for the sake of preserving the purity of our soul and those who are ready to cover every ambiguity of good and evil in our actions." "simple but wise, big but small, inherently honest with a streak of larceny...the world's greatest stooge, the world's greatest strength... the meek who are supposed to inherit the earth. We raise the crops, we dig the mines..we've been dodging left hooks since history began. In the struggle for freedom we've hit the canvas many a time...The character of a country is the sum total of the character of the little punks." Capra was much less confident of this in Meet John Doe; his fascist villain was a formidable force. We are well into the film before we ever see D.B. Norton, although his pervasive influence is felt from the beginning of the film in jackhammers, layoffs, and telephone calls. In our first glimpse of him, he is on horseback watching his personal uniformed stormtroopers/motorcycle corps drill in precision maneuvers; Norton commands them with a police whistle. Capra noted in the margin of his shooting script that Norton should be found reading Hitler's Mein Kampf and possessing medals and Legion of Honor ribbons. Willoughby's ambiguity makes him in many ways a richer character than Jefferson Smith. Raymond Carney argued that most Hollywood films "offer dramas based essentially on the conflict of various fixed character types," but that Doe took "the creation of the free character itself as [its] subject. "(15) "Free" may not be an accurate way to describe this character, however, for in Doe the character's formation comes at a price and is accomplished through larger forces. Carney believed that Norton's appeal rested in his ability to offer "the bribe of a stable identity...in the American moral interregnum, he provides the possibility of grounding unmoored values. "(16) Norton is insulted when Willoughby tries to assert an independent identity: "I picked you up right out of the gutter and I can put you back there again." Norton reminds Willoughby that he has been "paid the thirty pieces of silver." Willoughby himself doubts his ability to become the true spokesman of the John Does when he tells Mitchell that "a fellow'd have to be a mighty fine example himself to tell other people" how to live. John Willoughby poses with the "little people"
Meet John Doe was Capra's study of the process of character invention, and by extension, of hero invention. In Doe he moves from mythmaker to mythologist. Capra, like other mythologists like Dixon Wecter and Walter Lippmann, became interested in collective myths and heroes as "strategic railroad centers, where many roads meet regardless of their point of origin or where they are going. A political strategist claiming these junction centers successfully enough to convince the public of his right to be there, controls the highroads of mass policy...With such a fulcrum he can move a hundred million people. "(17) In Meet John Doe, Willoughby becomes such a collective symbol: the montage sequence assembled by Slavko Vorkapich shows Willoughby's picture paired with a dozen different causes on the front pages of national newspapers. 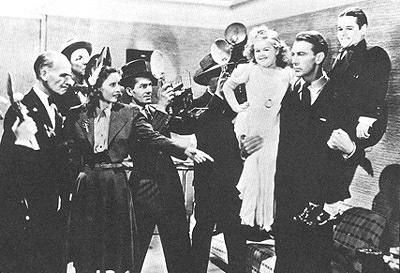 Later in the film, the press cynically manipulates American symbols by having Willoughby pose with a pair of midgets, who represent American citizens as "the little people." The people are handicapped in their battle with Norton because their clubs are ineffectual, their leader lacks many important qualities of the true American hero, the media controls interpretation, and, at the bottom of it, because Capra shared Emerson's doubts about the people's innate wisdom. 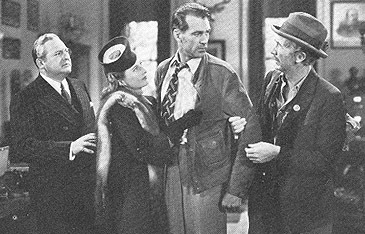 The John Does in this film don't want to hear hard truths: when Mitchell struggles writing Willoughby's radio speech, her mother advises her, "There are so many complaining political speeches. People are tired of hearing nothing but doom and despair on the radio. If you're going to have him say anything, why don't you let him say something simple...something with hope in it?" Mitchell tells Willoughby that they are handing the public "platitudes, things they've heard a million times--love thy neighbor, clouds have silver linings." Willoughby is on the right track when he senses the people are "hungry for something," but he lapses back onto an apolitical reverie in which the people are "just lonely, and wanted somebody to say hello to." 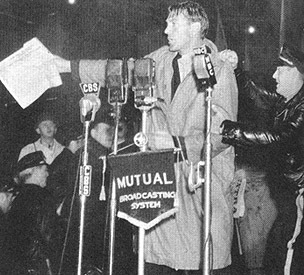 The people appear willing to listen to Willoughby after the microphone wires are cut at the convention. One audience member shouts, "Speak up, John! We believe you!" but it only takes a seconds before the crowd follows the example of a Norton plant in the audience who yells," John Doe's a fake! Booo!" A riot ensues. The mayor of Millsville holds a similarly dim view of his constituents. When Norton arrives at the City Hall, the mayor tells the townsfolk, "Everybody on your dignity. Don't do anything to disgrace us." The mayor tells Norton that the people were so excited about meeting John Doe "they nearly tore his clothes off." 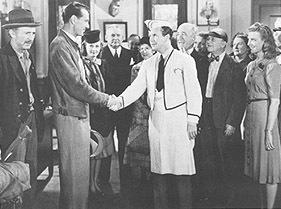 The role of the people in deciding John Doe's fate and audience reaction to Capra's portrayal of the people were chief among Capra's concerns as he shot five different endings for the picture. When an filmgoer wrote Capra a letter objecting to the club members' betrayal of Doe and their riot, Capra responded, "Your point is that the John Does wouldn't have turned on John Doe. You say you wouldn't do it, and neither would any other John Does. I say the world today is a pretty good example they do do it. "(21) In the first ending, John Willoughby follows through with the suicide, and in the film's final moments the Colonel cradles Willoughby's body and says, "Long John, Long John, you poor sucker, you poor sucker. "(22) This ending was never distributed to theaters, although Riskin fought for it, because Capra felt the public wouldn't want to see Gary Cooper killed off. Capra shot the subsequent ending in August 1940 at a Los Angeles icehouse. This version of the film ended with Ann arriving on the City Hall roof, pleading with Willoughby, and fainting after she says "I love you, John"; he abandons his suicide plans and carries her out. Capra added a tag scene to this ending in his script, although there is no evidence it was ever filmed. He wanted to add a scene showing Mitchell and Willoughby in a small town attempting to revive the John Doe clubs. The townspeople snub their efforts, and the film closes with a close-up of the Colonel looking directly and the camera and warning the audience, "Listen, you heelots. I'm giving you just one more chance." Capra reshot the entire ending in January 1941. He added Connell and the Colonel to the ensemble already on the City Hall roof (Mitchell, Willoughby, Norton, the mayor, and a few Norton associates). Willoughby is unmoved by Ann's pleas and in desperation she cries for divine intervention. Because it is Christmas, John is transformed. He wishes Norton a Merry Christmas. Norton's fascist tendencies dissolve, he orders Connell to print the true story in paper, and the Colonel concludes, "Well, looks like I gotta give the heelots one more chance. "(23) Capra recut this footage after the film was released. He kept Norton's conversion but replaced the Colonel's closing line with a chorus which combined Christmas carols and "My Country 'Tis of Thee." In March 1941 Capra abandoned Norton's conversion altogether, although he left in a scene of Norton watching Christmas carolers which he had spliced in to an earlier section of the film, a scene which today seems curiously out of step with the rest of the movie. Ultimately Capra had the Millsville club members come to Willoughby's aid. In a passage from his autobiography, Capra claimed that this ending was the suggestion of an anonymous audience member who sent him a letter signed "John Doe." Capra was literally left with nowhere to go at the end of this film. Institutionalization and internationalism demanded a hero more savvy than the one typically supplied by American myth, a heroic type anachronistic by the time Capra filmed Doe. Institutionalization and mass culture mediated the hero's relationship with the people in ways that made it difficult for him to appeal to them on the level he had before. The people, like Emerson said, wore "the fool's cap" and increased "their federal errors." Capra made one attempt to resurrect the American hero in It's a Wonderful Life by returning him to small-town life and small- town evils, but the life Capra filmed in Bedford Falls was, for most Americans, pure nostalgia. The film wasn't successful and after it, the hero didn't resurface in Capra's later remakes, documentaries, and musicals. 1  Dixon Wecter, _The Hero In America_, 488. Capra:  The Man and His Films_ Richard Glatzer and John Raeburn, eds., 79. 3  Charles Maland, _Frank Capra_, 56. 4  Frank Capra, _The Name Above the Title_, 297. 5  qtd. in Charles Wolfe, ed., _Meet John Doe_, 5.
the Masses in Frank Capra's Films," _Labor History_ no.4, 1990, 461. 8  Reinhold Niebuhr, "Where Have We Been? Where Are We Going?" from _The Irony of American History_, online. 11  qtd. in Wolfe 27. 20  qtd. in Wolfe 232. 21  qtd. in Wolfe 206. 23  qtd. in Wolfe 185.